Whether it makes you jump for joy or cry yourself to sleep at night, there is no denying that back to school season is in full swing! My Facebook feed is full of first day of school photos. My Pinterest boards are overflowing with "Easy Lunchbox Ideas" and "Healthy Breakfast Suggestions." Of course, the stores are jam-packed with backpacks, notebooks, crayons, pencils, and "Back To School Sale" signs. In fact, my kiddos went back to school yesterday. 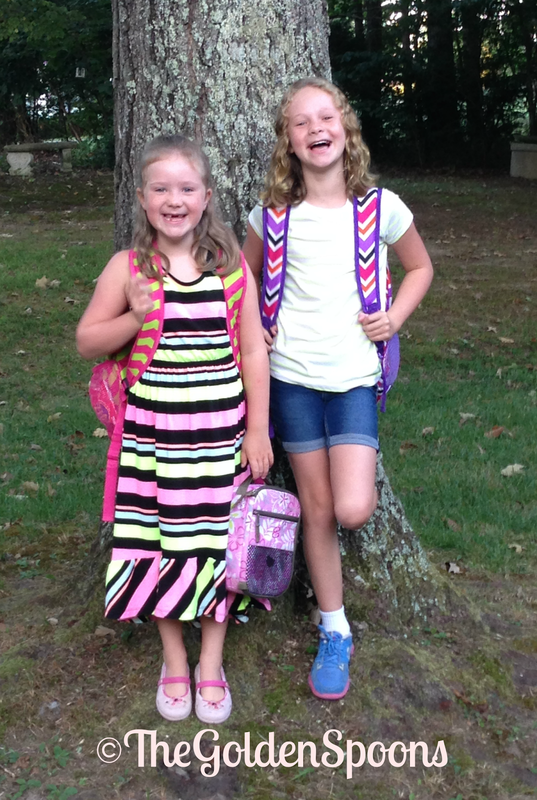 2nd grader & 4th grader who were, obviously, excited. You will just have to picture the sullen 7th grade with your Jedi mind because she was not in the mood for photos. It seems that, more than any summer in the past, this one flew by super fast. On some levels, I am ready for the kids to go back to school. However, we had a great summer, and I am, at the same time, not quite ready for it to end. 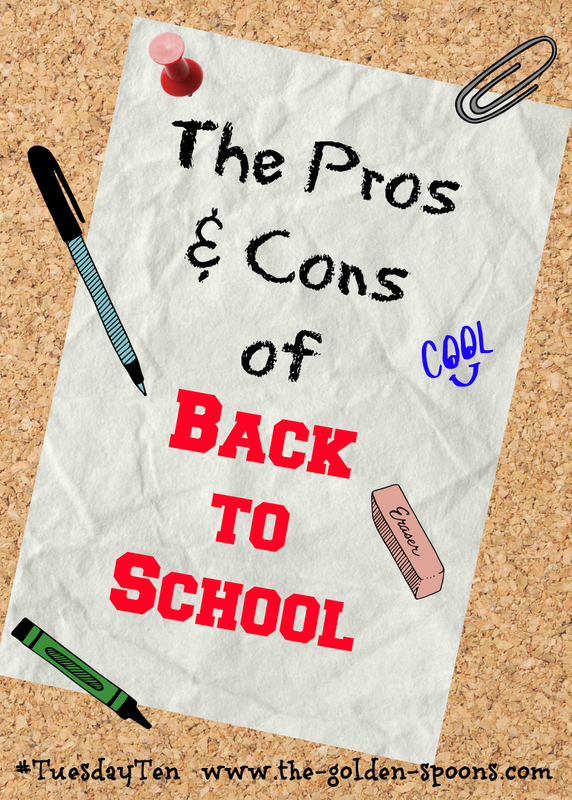 Needless to say, there are definitely some positives AND some negatives about back to school! I actually wrote a Tuesday Ten post about the exact same thing last year and I still feel the same way! PRO - I will finally get some quiet time. With the exception of a date night and my one day a week part time job, I haven't really had a break from my kids since early June. I love them, but, everyone needs a reprieve sometimes, right? Currently, I can't read, write, finish a complete thought, or do much of anything without interruption. I could really use some quite time! CON - Mornings. I am soooo not a morning person. During the summer, the kids sleep late; I sleep late. It's great! Once school starts, those alarms clock will once again be sounding bright and early. We'll all roll out of bed grumpy and delirious. PRO - We'll get back to a routine. I'm a planner and I like schedules. Although it includes early mornings, I like to have a plan for the day. Hopefully, I can get back into a writing routine, housekeeping routine, and workout routine as well. Right now, we are just being lazy and, many days, by the time we are ready to leave the house, the day is already halfway done. CON - That routine I'm talking about? Well, it tends to get really busy and I tend to get a little stressed. On top of homework and dinner, we end up rushing from here to there and everywhere. Bedtimes get juggled and baths get skipped. I've tried limiting my girls' after school activities, but it seems the busyness still takes over! PRO - Friends. The kids miss theirs and I miss mine. Once school starts, we will all be reunited! CON - I will once again become one with my minivan. During the school year I spend hours in my minivan. With one in middle school and the other two in elementary school, I'll have the privilege of sitting throughTWO carpool lines every morning and every afternoon. PRO - I might actually have a clean house for more than thirty seconds. Right now, if I am cleaning in one room, they are probably in the kitchen dirtying dishes. When I go to clean up those dishes, they will get out the play dough. When I am sweeping up the play dough, they will probably be making a snack or getting out some paint. Seriously, it's impossible. Once they are in school, I might be able to get the house clean and keep it that way at least until they get home! CON - Homework. As a former teacher, I would say homework is a necessary evil. I know that kids need to practice the skills they are learning in school and that there is just not enough time to get everything done while they are in the classroom. However, the last thing my kids want to do when they come home is more work. It ends up being a struggle to get them to do it. They whine; get frustrated. It's just not pretty. PRO - My kids' brains will stop turning to mush. At the beginning of summer, I felt guilty when they watched too much TV. Now, I'm just happy to get through the day with minimal arguing and if that means TV, then so be it! They have read some books, but overall, we're not exactly being intellectual these days. Once they are in school, I won't have to watch endless, ridiculous episodes of "Austin and Ally" or "Dog With a Blog." CON - Packing Lunches. My oldest is a vegetarian and the youngest is just a super picky kid. The middle one is not really too picky, but she is not fond of sandwiches. Packing lunches for them every day becomes incredibly frustrating and a task that I totally dread. So, when do your kids go back to school and are you looking forward to it??? **Be Sure to join our Tuesday Ten Facebook Group for weekly reminders and topics schedules!!!! Come link up again next Tuesday, September 2, when will honor back to school and Self Improvement Month by sharing 10 things we would like to learn! We have one more week here before school starts up here and got to be honest as much as I am looking forward to quiet time (pro) totally not good at mornings and getting everyone out the door (con) either. And now I added Lily to morning pre-school, who is so not a morning person, so god help me for what I will get with that and know that my mornings are probably going to be jammed with her whining and crying that she has to get up so early. I am hoping though to get her past this in pre-school and didn't want to have to worry about transitioning her for kindergarten next year, but still know my mornings will be anything, but fun! We have another week and a half till we're back in full swing! So I feel like I totally miss the wave of all those back to school photos. But I feel the same about the pros and cons. Packing lunches is my least favorite activity ever. But I love that my girl will be reunited with her friends! I nodded yes all through your post! I feel you on the pros and cons. I am a morning person so I have that in my favor. I'm grumpy when I've slept in or missed the opportunity for quiet time because I've slept it (that's really it). I'll try to get a picture on Thursday but Christopher at the moment is feeling like your oldest. I'm going to go find your lunches board. We need some excitement in the lunch department. I can't believe it's back-to-school time already. Where did the summer go?! I love these photos and your list of pros and cons is awesome. Even though I homeschool... I do the whole lunch prep thing too. I don't like our momentum to be too thrown off by me struggling to decide what to make for lunch, so I make it the night before. Really? Gosh - I felt like we were almost behind with this topic this week! Packing lunches are the absolute worst thing about back to school! I try doing the lunches the night before, but it is still frustrating. And, yes, the summer did fly by far too quickly! Great minds, indeed! Glad you like the button. The old one was bugging me (even though I made it) because it had nothing to do with the theme. Ooh! 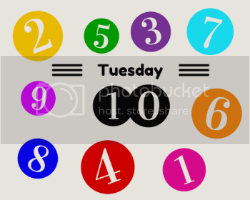 New Tuesday Ten button! I need to grab that one. 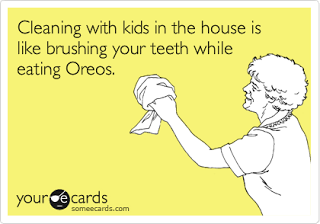 The brushing your teeth while eating Oreos comparison is a good one. I am not a morning person either. If I could sleep until 9 every day, I'd be the most pleasant and healthy person ever. I know this because it was my life for four years and it was splendid. I am SOOO not a morning person either! I hear you on the packing lunches..I am not a fan. I also get to do the two school pick up lines every day. For the most part Husband takes them in the AM so at least I get a break.